Cherries and Chocolate are a match made in heaven! But Jerte Picota Cherries make this recipe as they are so deliciously sweet and juicy. 1. Preheat the oven to 180°C/160°C Fan/Gas mark 4. Grease and line a 20cm square cake tin. 2. Put the chocolate into a bowl and place over a pan of simmering water making sure the bowl does not touch the water. Remove when melted and allow to cool slightly. 3. Meanwhile, place the butter and sugar into a bowl and whisk until light and pale. Gradually beat in the eggs and vanilla extract and the mix through the flour and melted chocolate until mixed through and smooth. 4. Now fold through the Jerte Picota Cherries and pour into the cake tin. Bake in the oven for 35-40 minutes. 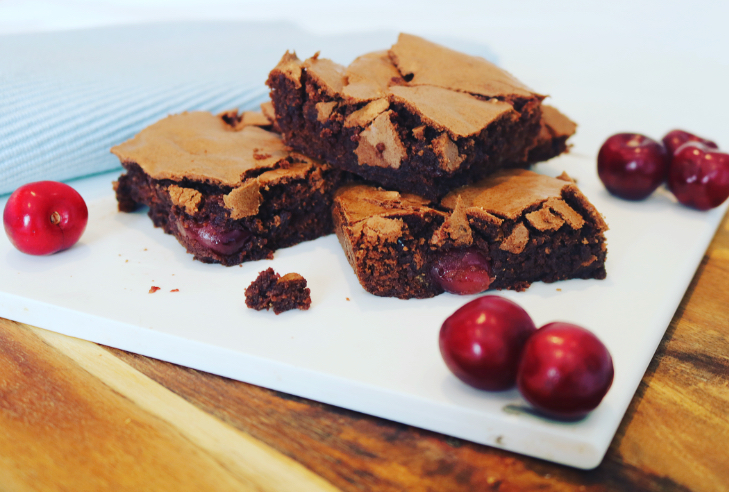 Allow the brownies to cool and then cut into squares. Enjoy! · It is a 100% natural product that follows a natural growing season, which is why the arrival of the Jerte Picota Cherry changes each year and why theyare only available for six weeks each summer.